Elections are about to be held in Kyrgyzstan. Russia's Vladimir Putin is predicting that "too much democracy" will merely result in instability while China and the USA look on sceptically. President Roza Otunbayeva is challenging traditional "clan logic" and pushing for a functioning democracy. This autumn, presidential elections will be held on 30 October in the Central Asian republic of Kyrgyzstan – and the extraordinary thing is that we don’t know who is going to win. This is not as paradoxical as it may seem. Some uncertainty over the outcome of an election should be perfectly normal, but in the geo-political area of which Kyrgyzstan is a part, elections tend to be called merely to confirm a result that has already been decided upon: in other words whether or not the current administration will remain in power, or have its power base actually strengthened. However, that is not the case in Kyrgyzstan. President Roza Otunbayeva, who came to power after the “democratic coup” in 2010, has announced that she will not stand as a candidate in the upcoming elections, nor will there be a “favoured” candidate, enjoying more patronage than all the others. The most influential of the more than 80 candidates who have announced that they will run, is the current Prime Minister, Almazbek Atambaev, leader of the Social Democratic Party. However, Atambaev has announced his intention to resign his post as head of the government six weeks before the vote, so as not to benefit from the so-called “administrative resources” that his position would afford him (almost unbelievable!). Nonetheless, Atambaev is no more of a favourite than any of the other party leaders, or any of the other presidential candidates from the upper echelons of government. In the Kyrgyz parliament there is no one dominant party, and it looks as if the elections will be contested by the main candidates on a fairly even playing field. So, at least on a formal level, Kyrgyzstan is persevering in its struggle towards the democratic goal decided upon when the country gained its independence 20 years ago. This choice in favour of democracy (loudly applauded by the international media and western governments) has been sustained at the cost of permanent instability, and with various lapses into the system of monarchical-absolutism which previously dominated the political landscape of Kyrgyzstan, and indeed all of the surrounding central Asian countries. The price being paid for this choice is high. In the twenty years since independence, there have been two coup d’états, several “near-miss” outbreaks of civil war and bloody inter-ethnic fighting. There is a risk that this high price will continue to be paid in future years, as the most serious issues facing the country have not yet been resolved: domestic and international tensions are still high and the resilience of the nation’s institutions is still in doubt. Despite the fact that the democratic elections in Kyrgyzstan are being seen particularly favourably in the West, it would be wise to look cautiously at events as they unfold over the next few weeks. Such caution is more than justified by the instability of the last year and a half. There is a real danger of there being just a bit too much democracy. Over the past year or so, Otunbayeva and her government have wielded power in a slightly contradictory fashion. They have skilfully avoided the outbreak of renewed clashes, but the problems behind the original conflict have not been so skilfully managed. They have been courageous in pushing forward the crucial political aim of establishing democracy but somewhat reticent in fighting the demons of nationalism and clan sectarianism. Without a doubt the referendum held on 27 June, 2010 which changed the constitution of the Kyrgyz Republic signalled a watershed. It brought to a close – at least temporarily – a period of extreme instability and marked the beginning of the arduous process of political and institutional reconstruction. In April 2010, a popular uprising against President Bakiyev and his corrupt power base led to a sort of “democratic coup”, without any intervention by the army (something of an anticipation of the 2011 uprisings in North Africa and the Middle East) and the forming of a provisional government led by Roza Otunbayeva, who had come from Kyrgyz diplomatic circles. It was all rather embarrassing for the interested “friends” of Bakiyev’s regime: Russia, China and the USA. The fall of Bakiyev and his flight abroad were followed in the successive weeks by heightened tension and unrest in the south of the country, where the deposed president’s clan still has its stronghold. As had happened on previous occasions, the disorder in the south developed into an inter-ethnic conflict between the Kyrgyz and Uzbek communities (who are roughly equal in number in that region). The bloodiest days of the conflict, 11-15 June, resulted in many hundreds of victims (unofficial estimates even suggest up to 2,000 deaths) and a climate of perpetual terror in some of the larger cities like Osh and Jalal-abad. The newly-formed government proved inadequate in dealing with this tragedy: they exercised no control over the local police, who in most cases either ignored, or even helped organise, the massacres (when they were not actively participating); they were slow to intervene politically to calm tensions before they reached boiling point and they failed to use the armed forces as a deterrent to stop the pogroms. Nevertheless, in the midst of chaos and bloodshed, and contrary to accepted wisdom, the new government insisted on holding a nationwide constitutional referendum, honouring the pledge they had made when they came to power. You could say that the referendum was held while the ashes of burnt-out houses were still warm, and with the dead only recently buried. But despite the timing it was a huge success. There was massive popular participation throughout the country and no major incidents. The people of Kyrgyzstan approved – by a vast majority and with no reports of corruption or irregularities in the voting – the proposal to reform the country’s political institutions towards a parliamentary democracy. This transformation from presidential republic to parliamentary republic involves the widening of the powers of Parliament and the government it elects, and the consequent limitation of power wielded by the President, who is elected by the people, but whose role is now confined to honorary functions and that of guaranteeing the constitution. This is in complete contrast to the trend over the last twenty years in all of the other independent states which emerged from the break-up of the Soviet Union – in Russia itself and particularly in Kyrgyzstan’s “cousins” in Central Asia: Kazakhstan, Uzbekistan, Tajikistan, Turkmenistan, and Azerbaijan, where the powers of the president – already considerable – have gradually increased to the point of becoming practically absolute powers “for life”, much like those of a medieval monarch. The Kremlin’s unusually bitter criticisms of this move towards democracy are an indirect confirmation of its value. “This is the road to instability”, prophesied the Russian Prime Minister Vladimir Putin, himself a long standing supporter of “managed democracy” in the countries of the FSU (Former Soviet Union). Nevertheless the Kremlin, despite its “reservations”, immediately established close relations with the new government in the capital, Bishkek. Similarly all the major powers were quick to maintain or even improve the status they had enjoyed under the previous regime, via agreements that were easily negotiated with the weak new government: air bases, trade agreements, mining concessions and the like – all the while maintaining a distant and sceptical stance as regards Kyrgyz domestic policies. While the USA was making sure that it renewed its agreement to rent the air base in Manas (a crucial logistical hub for the war in Afghanistan), Russia was increasing its military presence (two bases and a troop contingent) and convincing Bishkek to join its customs union, and while China was securing the gold mines of Solton-Sary, the domestic situation was not improving. There were moves to destabilize the country from outside by the supporters of deposed President Bakiyev, currently in exile, and also by the regime ruling neighbouring Uzbekistan, which was not the slightest bit pleased about having an example of a functioning democracy right on its borders. And of course at least some of the population found it difficult to conceive of democracy for the common good, and not just a means of defending the interests of particular individuals. Over the past twelve months, the dynamics of the domestic politics of Kyrgyzstan, have not been particularly positive. In some ways, Vladimir Putin’s prophecy has been fulfilled, regarding his fears for the stability of a system that has “too much democracy” in relation to the political maturity of the country’s citizens. These elections were promised, like the referendum, by the provisional government immediately after taking power. However the election campaign has seen voters fragment their electoral power in an absurd fashion, wasting their votes by supporting the dozens and dozens of mini-parties linked to local clans. After the vote that was held last October, only five parties eventually made their way into parliament and the biggest one – the Ata-zhurt party, linked to the clan of the former leader (President Bakiyev) – managed to get only 8.5% of the vote. The subsequent negotiations between these parties attempting to form a government were long and difficult and were only concluded two months later with a complicated system of allocating government positions and political power. An extremely heterogeneous alliance between the parties was put together and the Social Democratic leader, Almazbek Atambaev, was nominated as Prime Minister. Atambaev had been in the same role three years earlier during the Bakiyev presidency and had also been deputy premier in the provisional government. The elections themselves were also criticized by various minor political parties, despite the fact that international observers described them as the “most correct and transparent that have ever taken place in Kyrgyzstan”. Since taking power, the new and legitimate democratic government has not shown any signs of great efficiency. The massive structural problems that Kyrgyzstan faces have not been seriously tackled – problems which are undermining the social fabric of the country. These include: appalling poverty, particularly in the mountain regions; malnutrition, afflicting about a fifth of the population; levels of education which are so low that it has become difficult to find qualified personnel to fill available positions in the country’s civil service; and the scars left by the June 2010 inter-ethnic clashes – all problems which the government has done very little to address. Investigations into the June 2010 events are being conducted by Kyrgyz judges, but instead of responding to the demands for justice, they have generated further resentment and created more problems in the Uzbek community, seeing that they have officially identified those most responsible for the clashes as being Uzbek. This despite the fact that the vast majority of the victims (in terms of dead and injured and refugees forced to flee their homes) were actually from the Uzbek community. The judges’ obvious ethnic bias and their nationalistic “conspiracy of silence” has meant that a large number of “neutral” testimonies have not been taken into account. Supplied by foreigners and Kyrgyz journalists, these testimonies particularly relate to the role of the police in allowing, and even organizing, the violence against the Uzbeks in Osh and Jalal-abad. 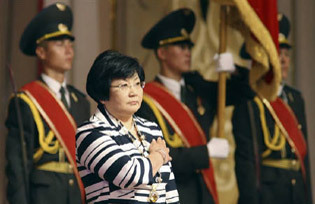 In the final analysis, all this means that despite some courageous efforts, neither Otunbayeva nor the new government have managed to have much of an effect on the institutions of the police and the judiciary inherited from the former regime – institutions which are deeply ingrained with “clan logic” and the concept of using public power for private ends. There is a risk that the darker and more backward forces in the country – those linked to the deposed president or those dominated by the same kind of xenophobic and “local” mentality – could once again seize the upper hand, and drag Kyrgyzstan back in line with the dreadful political standards of the region, thus snuffing out one of the most interesting and courageous political experiments that Central Asia has ever seen. Amidst the general indifference of world powers, great and small.